LightBulb is an open-source piece of software designed to automatically adjust your monitor’s gamma to improve your sleep quality and reduce eye strain. The purpose of the app is to reduce your exposure to the blue-light emitted by your display which is not recommended after sunset as it can disrupt your sleep pattern. LightBulb gradually adjusts gamma based on the time of day, warming your monitor’s color temperature as the sun sets. You can customize the limits of the color temperature and the program will perform the adjustments automatically based on the available data on the sunset and sunrise time. 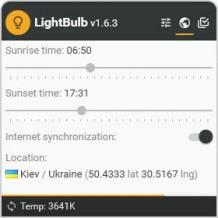 The sunset and sunrise time are determined using a geolocation API for your current location, although you can disable this option and manually configure the parameters.